Alright, so I'm going to spoil, "Batman #50," which comes out this week on July 4th, so be warned if you care. What I'm going to tell you isn't really surprising though. 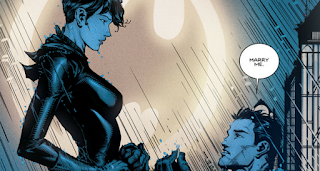 Basically, we have had this long and tedious build-up for what feels like forever to the big wedding of Batman and Catwoman/Bruce Wayne and Selina Kyle. 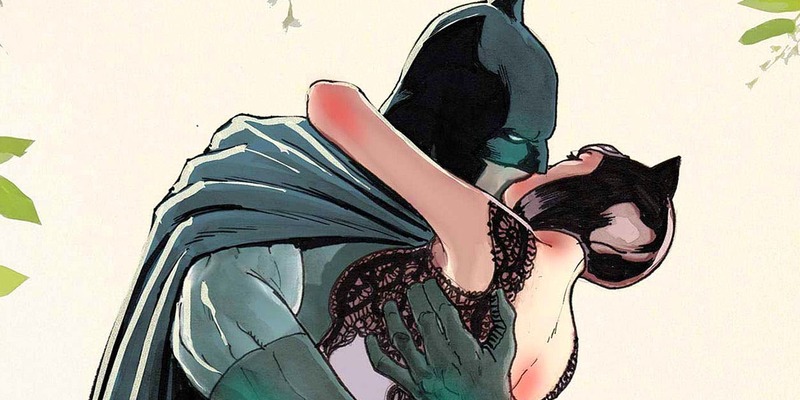 I had a feeling that because DC wouldn't want to change the character of Batman too much there would be something to keep the wedding from occurring. Perhaps I was being cynical about a big company not wanting to alter their cash-cow too much? I wasn't being cynical, as the NYT revealed, Catwoman decides not to show up for the wedding because she reasons that if Bruce Wayne is happy he'll stop being Batman and Gotham/the world needs Batman more than she needs love...or something. Hence, she doesn't appear and after an hour or so of waiting at the altar Batman realizes she ain't gonna show and continues his life fighting crime. It is just so predictable a plot to follow I'm almost wondering if this is some big trick by DC and the NYT and there actually will be a wedding in the comic, because come on, how hackneyed can you get with this whole, "I love you but can't be with you lest the world suffer,"-style of story? I don't get how the writer of, "Batman," Tom King, can make such amazing stuff sometimes with, "The Vision," or, "Miracle Man," but I've always found his writing on Batman relatively dull and dreary of what I've flipped-through. The rest of the internet seems upset about how DC acted all coy about the wedding and then will do exactly what we expected. Comic retailers are apparently pretty pissed too as some ordered big for what they thought would be a milestone issue along the lines of the death of Superman and instead it is all one big anticlimax. It's disappointing for sure, but the cynic in me saw it coming from a mile away, but I am surprised DC didn't think-through how mad some folk might get who ordered a ton of books under the auspices of it being a wedding issue. There's gonna be some hard feelings about this for awhile, that's for sure. I Attended the Toyman Today and it Rocked! It's July 4th, Please Be Safe!